Hugging the tip of the Australian east coast, Victoria is Australia’s second-smallest state, covering 227,600 square kilometres – roughly the size of the British Isles. Victoria’s capital, Melbourne is located around the shores of Port Phillip Bay. The city itself sits beside the Yarra River, about five kilometres from the bay. Victoria occupies the south east corner of the continent between latitudes 34 and 39 south and longitudes 141 and 150 east. It covers 227 600 km2 – about the same area as England, Wales and Scotland; three-fifths of Japan and slightly larger than the US State of Utah. About 36 per cent of Victoria is covered by forest with the major forest belt in the east. The highest peaks are Mt Bogong (1986 m) and Mt Feathertop (1922 m). Victoria’s 1800 km coastline borders on Bass Strait, which separates the mainland from Tasmania, and in the west on the Southern Ocean. It’s a generally rugged coastline but includes many wide sandy beaches and three large, almost fully enclosed harbours. Melbourne and Geelong are on the shores of the most important of these harbours, Port Phillip Bay. Victoria produces almost a quarter of Australia’s total rural output. Agricultural and pastoral products include wool, sheepmeat and beef, wheat, oats, barley, maize, tobacco, hops and fodder crops, citrus, grapes, apples, stone fruits and vegetables and dairy products. Victoria is Australia’s main producer of mutton and lamb, dairy products and dried vine fruits and substantial amounts are exported. 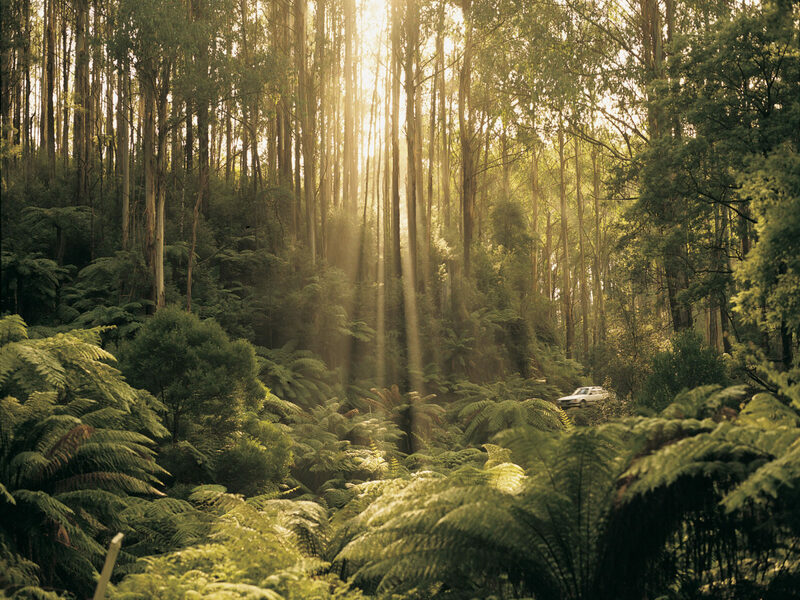 Victoria is also an important producer of timber from its 8 million hectares of forests. This includes 223 000 hectares of forest plantations. The Latrobe Valley, east of Melbourne, has one of the world’s largest deposits of brown coal and is the resource base for Victoria’s internationally competitive supply of electricity. The coal is used to produce most of the State’s electricity. Large oil and natural gas fields exist in the Gippsland Basin, off the coast of eastern Victoria. These provide 50 per cent of Australia’s domestic oil production, while assuring Victoria of natural gas supplies well into the next century. Most of Australia’s large mining and minerals processing companies are headquartered in Melbourne. It is also a major centre for mining project management, research and development. Victoria is one of Australia’s major manufacturing States. Its factories employ about 34 per cent of the national labour force. Large industries include automotive manufacture, food processing, textiles, clothing and footwear, paper and paper products, oil refining, petrochemicals, aluminium smelting, information technology and telecommunications and aircraft production. The food processing sector contributes 26 per cent of the State’s manufactured exports. A major aluminium smelting industry is located at Portland and Point Henry, producing about half a million tonnes of aluminium a year. Victoria accounts for some 45 per cent of Australia’s communications industry production. Major telecommunications equipment manufacturers and computer companies are also located in the state. Other significant industries include forest products (including pulp and paper production), chemicals, plastics and rubber and scientific and medical instruments. Victoria’s State parliament consists of an 88-member Legislative Assembly and a 44- member Legislative Council. The State Governor, as representative of the Queen, is Head of State and gives formal assent to legislation. The judiciary comprises Magistrates’ Courts, Country Courts and the Supreme Court and is the final arbiter of legal disputes. Schooling is compulsory for all children between the ages of six and 15. Thirty-nine per cent of graduating final-year secondary students go on to tertiary studies. The State has eight universities in Melbourne and in country areas. There is a comprehensive technical education system catering for trades and sub-professional training needs. Melbourne’s public transport system consists of major roads, railways and tramways that fan out from the central business district. Melbourne’s tramway network supplements an extensive electrified suburban rail network and bus services. Because it is densely populated by Australian standards, the State has good roads reaching into all but the most remote regions. National highways connect Melbourne with Sydney to the north and Adelaide to the west. Melbourne has the nation’s busiest general cargo port and largest container port. Eight domestic airlines and 30 international airlines provide regular services into Melbourne’s international airport, Tullamarine. Victoria’s major trading partners are Japan, USA, New Zealand and Singapore. Gold, textile fibres, non-ferrous metal products, dairy products and meat products are the major exports. Main imports are vehicles and machinery, largely from the USA and Japan. Melbourne is within a short drive of beaches, ski resorts, a richly varied rural hinterland and spectacular forests. Visitors can stay on host farms, or hire a metal detector in country where prospectors still find gold nuggets more than 140 years after the gold rushes. Water sports, rock climbing, gliding, hang gliding and hot air ballooning are available. In the far north west, the Mildura district is an irrigated fruit growing oasis on the arid fringes of the outback. Westward are basalt plains studded with extinct volcanoes and the grand colonial mansions of the squatters, the pioneers who made Victoria some of the world’s richest fine wool country. Kangaroos and koalas can be seen in the national parks, and there is a famous dusk parade of fairy penguins on Phillip Island. Melbourne Zoo and Healesville Sanctuary are also worth a visit. The city of Melbourne is noted for its many fine restaurants.